Schematic representation of deployed occulter with spacecraft. A thin plastic "starshade" shaped like a giant daisy flower could one day help astronomers observe faraway planets by blocking out unwanted light from their parent stars, a new study reports. When telescopes point to a distant planet, the small amount of light reflected by the planet is overshadowed by the light from its parent star, making it especially difficult to be seen. For this reason, only two extrasolar planets have been seen directly, and there are no detailed images of any planet beyond our solar system. One way to tackle this problem is to place a shield, known to Sun-watchers as a coronagraph, inside the telescope. In this way, astronomers block out the main light from our own favorite star, providing a view of the environment around it. However, because of light's tendency to spread out, it bleeds around the circular edge of a conventional coronagraph and swamps any light coming from a planet. 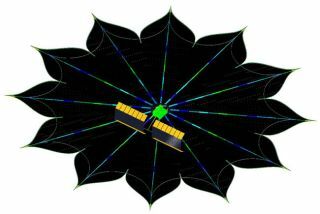 The proposed starshade, however, would get around this problem by diffracting light away from the area close to the star [how it works]. "Think of an outfielder holding up one hand to block out the sunlight as he tracks a fly ball," said study author Webster Cash, director of University of Colorado at Boulder Center for Astrophysics and Space Astronomy. "We would use the starshade as a giant hand to suppress the light emanating from a central star by a factor of about 10 billion." The idea is presented in the July 6 issue of journal Nature. Cash says the starshade concept is particularly compelling because it can be built using existing technology. If successful, alien planet features like oceans and polar caps and even biomarkers such as oxygen and water could be identified, Cash said. "We will be able to study Earth-like planets tens of trillions of miles away and chemically analyze their atmospheres for signs of life."